Costa Dulce has grown organically, integrating with the environment, and has become one of the premier wellness centers in Central America. We are committed to a grass-roots approach to tourism and a more sustainable future through improving the social, economic and environmental well being of our surroundings. Costa Dulce has 11 individual Bungalows, two yoga shalas, a lounge/honour bar, sea turtle hatchery, spa, surf school, food garden, and a restaurant the Dulce Cocina. 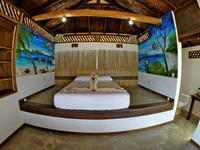 Our big yoga, fully equipped yoga shala features stunning views and the soothing sounds of jungle and ocean. Our 900 square foot rancho style yoga platform stands alone over-looking Escameca Nature Reserve and the beach. It also doubles as an excellent event center. Costa Dulce offers full time, fully staffed kitchen and dining area the Dulce Cocina. We serve Nicaraguans best local, fresh, organic food, carefully selected and served with love. At Costa Dulce we care a lot for our surroundings and we contribute actively by supporting multiple initiatives such as reforestation, school projects and our own turtle hatchery -saving over 30 000 turtles annually- right at the beach. Practice yoga with a stunning view as soothing sounds of jungle and ocean intermingle. Monkey infused yoga sessions have been known to occur. Our 900 square ft rancho style yoga platform stands alone over looking escameca nature reserve and the beach. It also doubles as an excellent event center. WIth a large fully equipped kitchen and common area you can host dinners for up to 60 people and then dance the night away. Round-trip transportation to and from Managua Airport (MGA) is included on the first and last day of the trip. It takes 2 hours 45 minutes to get to the venue from the airport. Room with 1 double-bed, 2 single-beds, and a private bathroom. Two double beds (one in a loft) and shared bathroom steps away (shared with one other room). Room with 1 double-bed and a private bathroom. Big bungalow is the spacious octagonal bungalow, with a beautiful view of the jungle and beach. 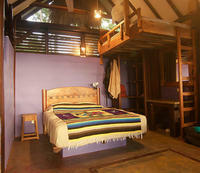 One double bed and 3 singles, with a private bathroom, veranda, hammock and sofa. Room with 1 double-bed, 2 single-beds, and a shared bathroom with one other room. Room with 1 double-bed, 1 single-bed, and a private bathroom. Costa Dulce Beach bungalows & Retreat Center is located on pristine Playa Escameca, a beautiful sandy beach and surf break just 30 minutes south from San Juan del Sur on the Pacific Coast of Nicaragua. At Costa Dulce you can participate in many activities such as surfing in the ocean or paddle boarding in the lagune or enjoy an amazing wellness experience with daily ocean view yoga classes or hour long massages (or both!). Besides, you can explore the Collado Nature Reserve or the waterfall- , go fishing with local guides or go horseback riding on the beach. Being close to the backpacker hub of San Juan del Sur there are many activities just a short drive away, Zip lining, Art projects at a local gallery/Studio. Street artisan and a host of vendors along with a vibrant local market as well as a Saturday farmers market. And San Juan del Sur is famous for it's nightlife, so if you like a night out on the town we've got the solution. There is an awesome little beach bar open weekdays that serves lunch and on the weekends open in the evening for early dinners.